High Arctic Energy Services is committed to protecting the health and safety of our personnel, customers and visitors to our operations, and minimizing the environmental impact of our activities. We value human life above all, and we will not prioritize production over safety. 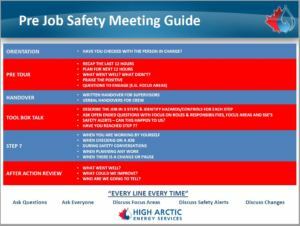 No job is so urgent or important that the necessary steps for safety cannot be undertaken. All Line Management, including the front-line Supervisors, have the primary responsibility for safety leadership. All employees must comply with the Management Systems that underpin this policy, and we will provide information, instruction, training, and resources for their implementation. We hold each other personally accountable for involvement in our safety performance and emphasize that a quality safety management program provides the foundation to effective, sustainable operations. A commitment by us all to the application of superior safety management practices combined with the implementation of structured and effective systems will ensure that we meet our Health and Safety objectives. We are active members of the Canadian Association of Oilwell Drilling Contractors, Petroleum Services Association of Canada, and hold a COR certificate. To provide our customers with timely access to our safety reporting and standards we are active subscribers to ISNetworld, ComplyWorks and Avetta. 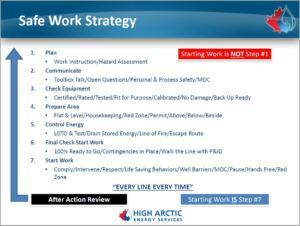 High Arctic Energy Services introduced a risk management tool in 2017 to proactively measure behavior and culture in the field. The Safe Work Strategy (SWS) Program provides crews with a process and tools to perform work safely and productively by focusing on the key concepts of job planning, communication, ensuring equipment is fit for purpose, the work area is prepared, all energy is controlled and a final check before starting work. 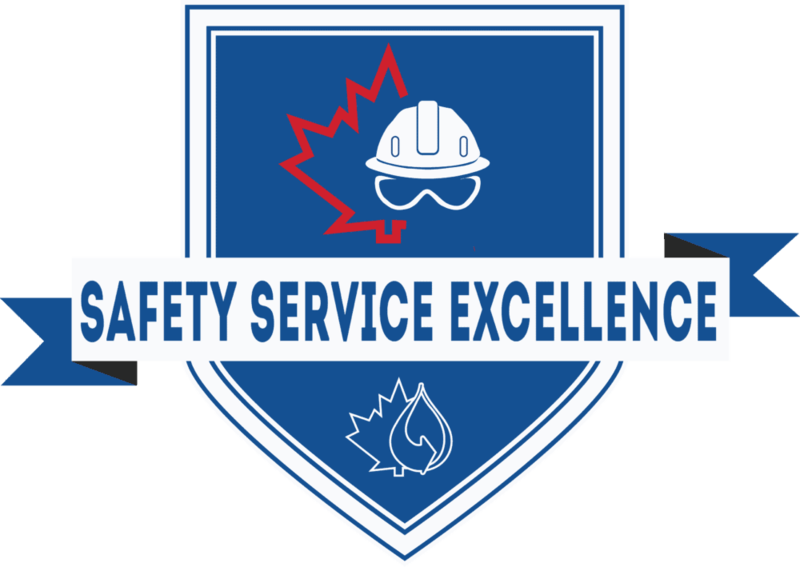 The SWS program works in conjunction with a Supervisor Safe Work Strategy (SSWS) program that directly targets the supervisor level of the organization through assessments of their use of the SWS program. This ensures that our personnel directing the work are modeling the safety behaviours our business strives for. The intent of the program is to create a culture to that drives “Excellence in Safety & Service”. As a result of this program we have seen a consistent downward trend in our overall TRIR that correlates with the number of SSWS assessments completed.